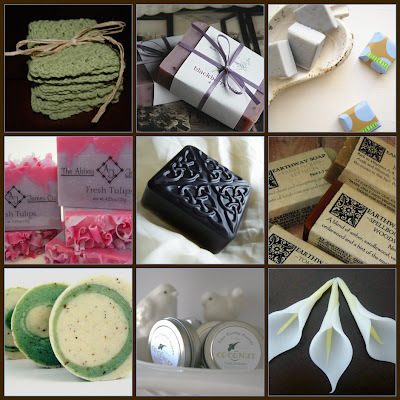 I love handmade bath and body yummies. They are a great way to pamper myself without blowing my very tight budget. And, as you have read before, my budget calls the shots around here. So it's nice to find things that I can buy and really enjoy, guilt free. I hope you have a great weekend. I'm off to Such and Such and Chocolate and Steel to check out their great eye candy. must check out "in a lather". What a great looking soap. I went to whole foods the other day and bought a sliver of a soap that cost me $6. That is when I made the decision that I need to plan ahead and start buying my soap from some handmade companies. great list. Mine will be up later today. Mine will be up in the afternoon too, but your selection is sooo timely. I'm feeling very stressed (wonder why) and could really use some of these lovely soothers.